•Northern cities and Scotland have been worst hit by store closures so far, but people anticipate many more to come. By partnering with James Child, Retail Analyst at EG, we can see there doesn’t seem to be any sign of these closures letting up, he says: “It is quite likely that there will be a continuation, if not an increase of the negative headlines in retail. The raft of CVA’s and administrations in the sector has culminated in an expected 1,600 store closures across the UK, with over 18 million square foot of prime retail real estate vacated. When we break down the events of 2018 there are some trends which appear to be continuing into 2019 – due to fragile trading conditions and economic uncertainty. So what would bring people back to the high street? How will the high street look in ten years? After asking consumers what they think the high street will look like in ten years, it seems that consumers are worried that independent stores won’t exist. The list below runs from most likely to least likely. Which parts of the UK have been hardest hit? “With store closures flooding our newsfeeds recently, we were interested to find out what the future holds for the high street and how consumers’ shopping habits might affect retailers’ footfall. It is obvious from our research that people do still like going into store to shop, but it just isn’t as accessible as online shopping is. 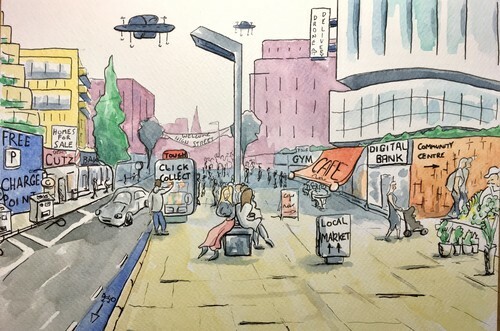 After surveying Britain’s consumers and finding out what the high street could look like in the future, KIS Finance have collaborated with Sam Edwards, an illustrator from London, to visual these changes. The illustration can be downloaded from this Dropbox link. This press release was distributed by ResponseSource Press Release Wire on behalf of KIS Finance in the following categories: Leisure & Hobbies, Business & Finance, Retail & Fashion, for more information visit https://pressreleasewire.responsesource.com/about.